Part of the wave of Iranian artists enjoying increasing international recognition, Golnaz Fathi has turned a childhood passion into a highly individual art form. She became fascinated by calligraphy when she was growing up in Tehran and reached the very top of the craft when she graduated from the Iranian Society of Calligraphy in Tehran in 1996 after six years of study. She then turned to her first love, art, and has developed her own unique style, which incorporates her mastery of calligraphy. Speaking from her Tehran apartment, where the walls are adorned with her distinctive paintings, Fathi explains the progression of her art. 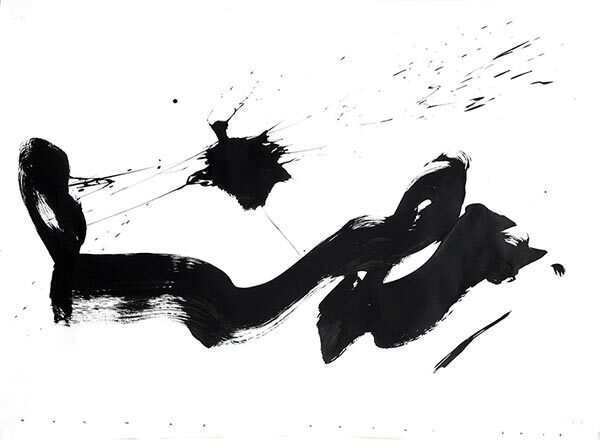 "As the years have passed, my work has become pure abstract – I am a choreographer and these are my dancers," she says, referring to the calligraphy characters. She uses two contrasting techniques – one with acrylic paint and brush, which she says is similar to the "action painting" pioneered by the American abstract expressionist Jackson Pollock, and another with a very fine pen that produces a result of layers of hundreds and hundreds of lines. 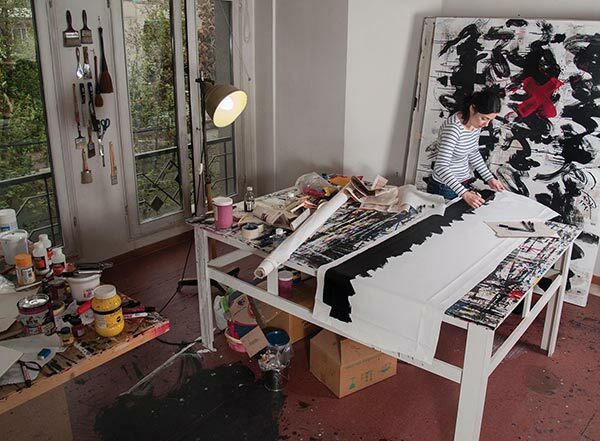 Fathi's first solo exhibition in Mainland China was at the Pearl Lam Galleries Shanghai in 2013, when she and renowned Chinese calligrapher Wang Dongling created new works in a joint "art performance". 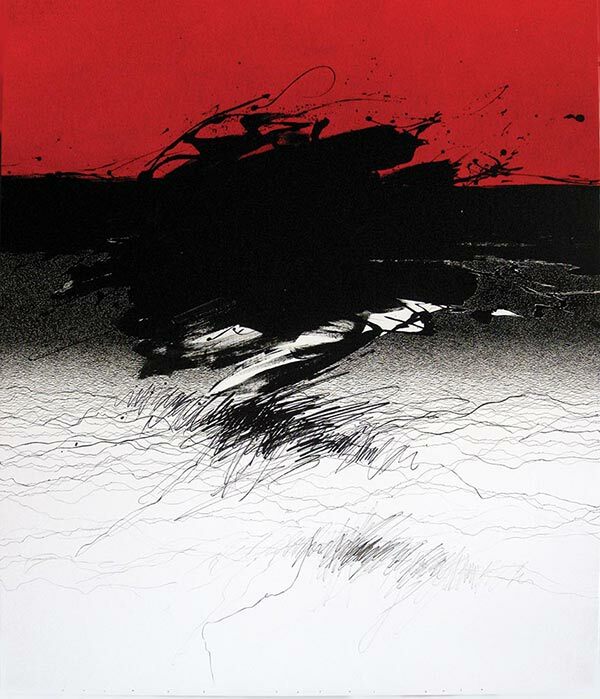 Although they could only exchange limited words in English, the artistic bond proved to be more than an adequate substitute for verbal communication – Wang has his own abstract style of what he dubs "calligraphic painting". "It was fabulous, a cultural bridge," says Fathi. "We did six works together at the gallery in front of an audience – some of them I started, some of them he started, and the other one added to it to finish." While she says the Persian and Chinese calligraphy styles are quite distinct, they have one important thing in common: "The kind of dedication you have to give to become a master is quite the same. You cannot become a calligrapher if it is just a hobby – it should be your life." Fathi is holding a second exhibition in Shanghai in May; gallery owner Pearl Lam explains: "I like to work with artists who can surprise me and make me think differently about art and life in general. Golnaz is such an artist." And turning calligraphy into an art form? "Calligraphy is prized as a form of self-expression and self-cultivation; the principles behind it are still relevant to art today." She adds that many artists in China are "reinterpreting traditions, especially ink-brush painting and Chinese abstract art". Lam says that the Chinese market is becoming increasingly receptive to artists from different backgrounds, such as Fathi. "Art can act as a bridge between cultures and facilitate communication through the exchange of ideas," she explains. "By understanding another culture's art, one can better understand how they live and think, which also reflects on one's own culture through the similarities and differences." The Tehran-based Dastan's Basement is the first Iranian gallery to participate in Art Basel Hong Kong, which runs from March 29 to 31 at the Hong Kong Convention and Exhibition Centre.